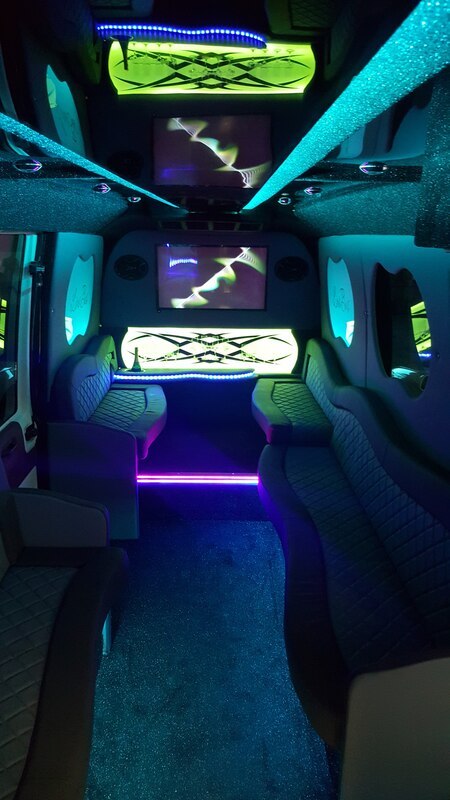 It’s been 3 months in the making and finally Limos North West is proud to offer this stunning new 16 Seat Limo Bus to the Northwest for your special occasion. You may know these novelty vehicles as Party Bus’s but here at limos north west we’ve done things slightly different. We didn’t want a run of the mill converted minibus we wanted luxury & sophistication with a hint of “Lets get this Party Started”! 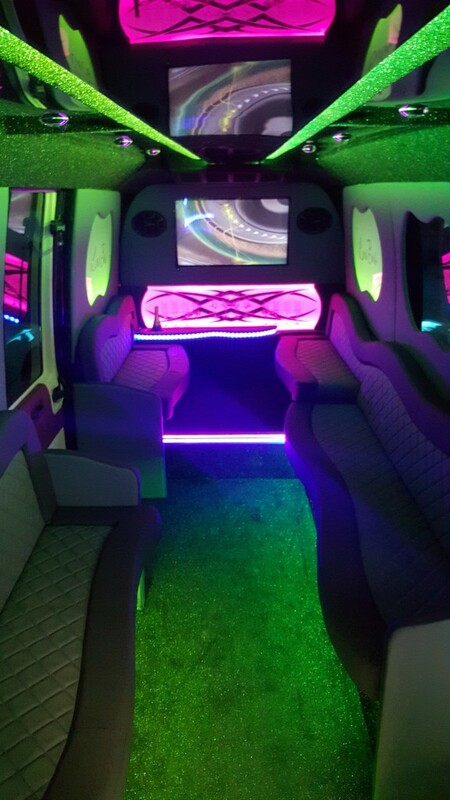 With the above in mind, from start to finish hours of thought and many sleepless nights has gone into making this Limo Bus ultimately amazing, from the furnishings & Paint work right down to the sound system, everything has quality about it. 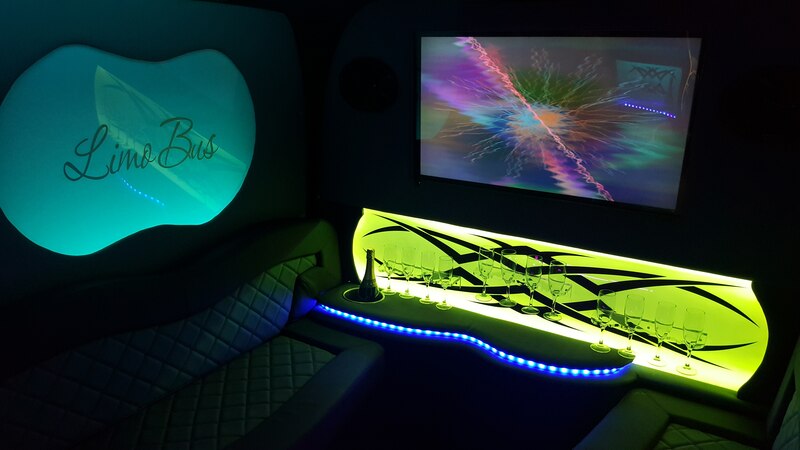 Passengers on board this Limo Bus have access to all the features including the latest touch screen music system. A crisp & clean yet thumping sound system designed by Hertz will make the 1000’s of audio and music video tracks a pleasure to listen to and if you dare turn it up! 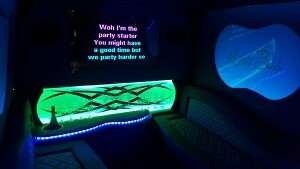 it literally is a nightclub on wheels, oh and lets not forget “KARAOKE!! 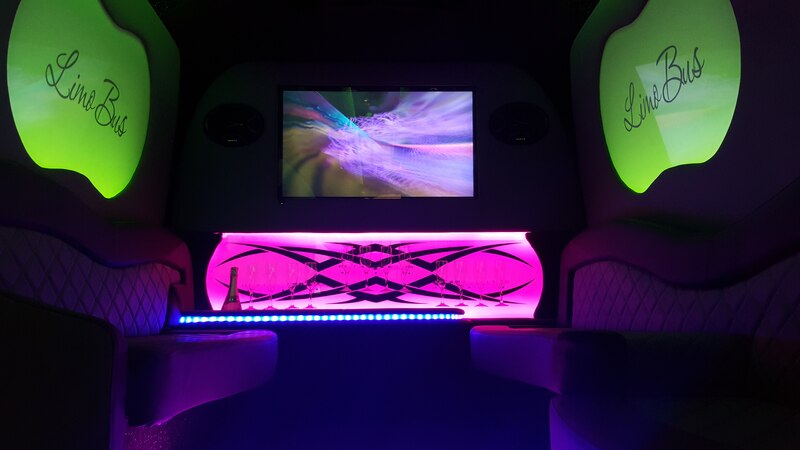 !” again with 1000’s of sing along karaoke tracks to choose from this limo bus will make your night one to remember. The whole Limo Bus conversion has been completed in house here at Limos North West in Warrington with the exception of the upholstery, which we can thank Anthony at Dub Upholstery for his time and patience with us on this project. So with cuts, bruises, welding flash and some choice words all forgotten about, it’s time to get this 16 seat limo bus to work in the North West for you all to enjoy. Booking are now being taken for this vehicle, you can call us on 01925 444644 for quotations or visit the website and fill in the online enquiry form. Is this real or Photoshop? Apparently one of our chauffeurs saw this!